Lawns play a significant part in improving the attractiveness of your homestead. In order for grass to grow, it requires water. The water source can either be rainfall or irrigation water through sprinklers. Rainfall is essential in providing an attractive green lawn. However, when there is excess rain water like during a rainy spring season, your lawn will likely grow well but it can also get negatively affected. There are different lawn problems caused by excess water. 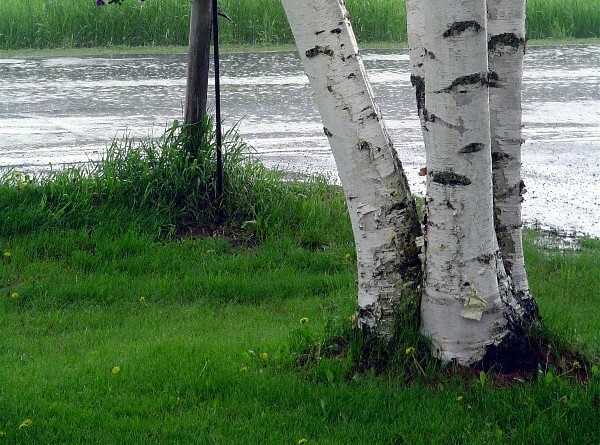 A rainy spring affects your lawn in different ways. There are ways to avoid these problems. Having said that, let’s look at how excess rain water in spring negatively affects your lawn and the way forward. a) Lack of oxygen – excessive rain water causes lack of oxygen by filling the air spaces in the soil. Grass roots require oxygen to grow. Lack of proper supply of oxygen drowns the grass roots. As a result, the grass will die slowly. b) Wet soils soft and are thus also susceptible to increased compaction from foot traffic. Lawns will find it harder to grow in compacted soils. Grasses have fine roots that may have difficulty in hard soils. c) Shallow root growth – The fact that grass roots don’t have to go deep into the soil profile to find water, can cause shallow root growth. The shallow root growth is a recipe for drying of grass when dry weather occurs because the roots lack the necessary depth. As a result, there can be patches of weak or dying grass. d) Nutrients loss – Excess water leads to increased runoff. The runoff washes away important plant nutrients required by the grass. 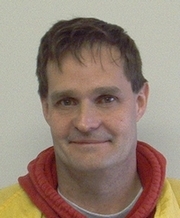 Additionally, there is increased leaching of nutrients. This makes nutrients unavailable to the grass. As a result, grass growth is hampered. e) Grass becomes highly prone to insects and diseases – Shallow root system causes a lot of stress to the grass. Due to this, the grass becomes highly susceptible to diseases and insect damage. f) Fungus Diseases – Soil logging due to excessive supply of water, can cause grass roots to rot. When the roots rot they are easily invaded by fungus. This starts as yellow patches within your lawn. Once the fungus establishes it is difficult to eradicate. Few fungicides are available and/or allowed. You will be required to reseed the bare or dead patches in the fall. g) Excess weeds grow in your lawn – Too much rainwater can cause weeds to grow in your lawn that has become stressed. Most of these weeds are hard to kill. h) Increased lawn fertilizer requirement – Since the lawn is not getting the essential nutrients, you have to supplement through fertilizer application. This can add to the cost of lawn care. It is important to ensure that you work closely with lawn care experts to make sure that your lawn is properly maintained by professionals. 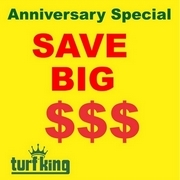 Lawn care experts like Turf King Hamilton have the necessary skills and experience to look after your lawn at all times. The professionals have lawn care programs to ensure that your lawn is in the best condition at all times. Regardless of the weather condition lawn experts help minimize damage to your lawn. Ensuring that there are sufficient nutrients. 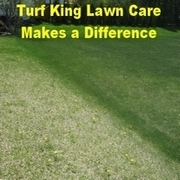 Provide lawn programs to address weed and insect concerns. Rainfall is helpful in maintaining a good-looking green lawn. However, when the rainwater is in excess like during a rainy spring, it can negatively affect the attractiveness of your lawn. Problems caused by too much rain are, as elaborated above. However, through the help of lawn experts, it’s possible to avoid lawn problems brought about by excessive rainwater. 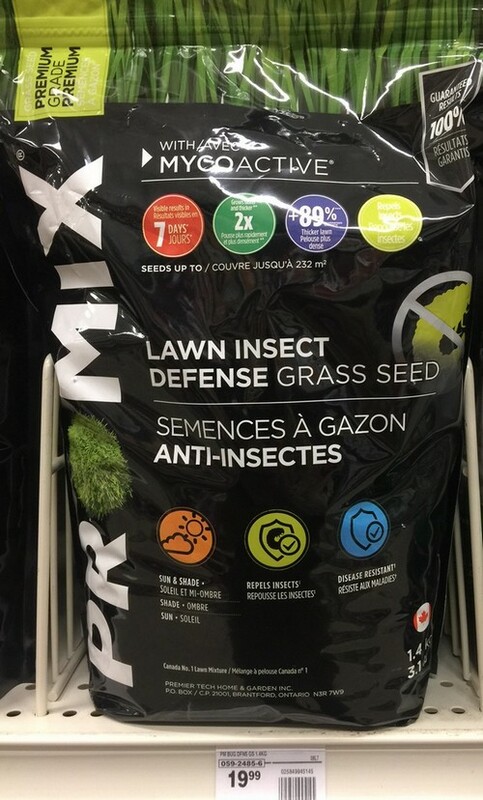 For Lawns with Chinch Bug problems- we at Turf King Hamilton have always recommended that lawns at risk for chinch bug infestations should be seeded or overseeded with turf-type perennial ryegrass varieties that repel insects. When we overseed lawns we always use a mix with this type of grass in the mix. As well, the small packages of grass seed that we may leave at your home does indeed contain this insect repelling grass seed. At a retail store this week - I saw a bag of grass seed on the shelf. It is labelled as Lawn Insect Defense Grass Seed. My assumption is that it does contain endophytic perennial ryegrass. 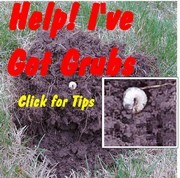 Seeding with this grass does not guarantee that chinch bugs will not damage your lawn. However, it is one of the tools that you can use to help reduce the devastation that chinch bugs can do to lawns. This is especially important if we get another hot, dry summer. 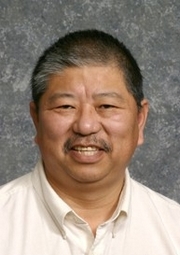 Lawn care technicians will be on your lawns soon. Finally took a photo of a small clump of grass that I noticed while emptying our kitchen compost container into the garden compost bin. Just beside the bin, I noticed a single clump of grass that was so green. We have had a few days when the thermometer hit 15 degrees Celsius. Not normal temperatures for February here in Hamilton, Ontario. This turf plant was just at the edge of our vegetable garden. So it is in a very sunny spot, and the dark soil nearby will warm up quicker than the soil that is insulated by a cover of grass plants. Today, there were a few snowflakes - as the temperature has dropped to -5. 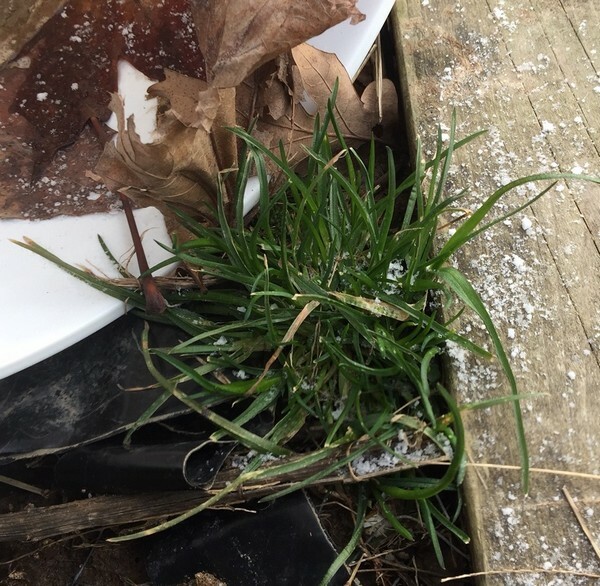 But the grass plant doesn't mind a little snow or cool temperatures. In the spring, lawns turn green as the soil warms up. In the spring, however, your lawn will shed its winter colour and turn green faster if the soil is warmer. It will turn green as the sap starts to flow but the signal to start the sap flowing is dependent on soil temperature. What can you do to get your lawn to green up faster and shed the winter "blah" of brown and yellow? If you had mowed the grass shorter at the last fall cut, you may have already done the first step. If the grass blades are shorter going through the winter, you will reduce some winter lawn diseases. And you will have less insulation in the spring- thus allowing the soil to warm up a bit faster. So if you did not cut the lawn shorter last fall- as soon as you are able to mow- set the mower to about 2" instead of 3" and give the lawn a quick haircut. This removes some of the grass that is shading the soil. As the soil warms, the grass will turn green. You can also give the lawn a good raking. Here instead of just removing the height of the grass blades, the raking will remove some of the dead grass blades (and maybe some of the green ones too.) This will thin the density and again allow the soil to warm quicker. The raking will also stimulate some growth. It's like pruning a shrub. Pruning will stimulate the plant to produce side shoots and to thicken up. Of course- there will be folks who wonder if the raking is a necessity or not. I always say when asked- "the benefits of raking include fresh air, exercise and maybe even some sunshine." See this article "Do I need to rake my lawn in the spring?" What will do the trick for clover?